The past is a foreign country…..
Ian Staples: electric guitars, violin, toys. Jon Seagroatt: soprano saxophone, bass clarinet, flute, percussion, toys, electronics. Red Square’s website. Red Square’s Facebook page. Guerssen’s ‘Rare and Lost 70s Recordings’ is available from all over the place is a myriad of formats: Vinyl, CD, iTunes and Bandcamp, to name a few………. 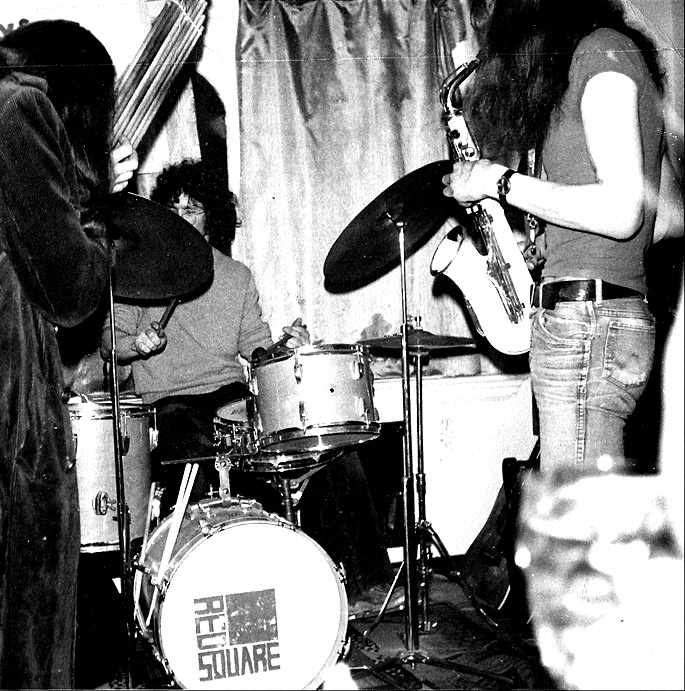 Red Square is the pioneering group that myself, Ian Staples and Roger Telford formed in 1972. It broke up in 1978, before re-forming in 2008 as a result of renewed interest in the band’s pioneering bridging of the worlds of psychedelia, metal and free-jazz. Pre-dating Sonic Youth by seven years, Last Exit by a decade and the Thing by twenty five, our railing aural assaults were once considered too extreme for commercial release, so in a gesture of proto-punk defiance we self-released two now-impossible-to-find cassette-only albums, ‘Paramusic’ (1975) and ‘Circuitry’ (1976). We conjured up an astonishingly different music in pre-Thatcher Essex. ‘They’ were waiting patiently for ‘Her’, the great dispenser of bribes and facile nostrums to the selfish and the stupid. Sometimes, to their horror, they got us instead. Red Square was my teenage gang. Red Square gave me family. I grew up there. All four albums are available directly from me, via Paypal, here, or from Discogs. 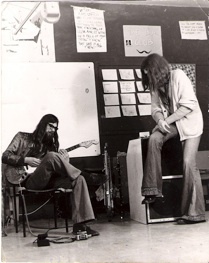 The groundwork for the band’s sound was laid when Ian Staples and I began a musical collaboration in Southend-on-Sea, Essex in 1972, following encounters at a number of experimental music workshops. Likewise, I had been galvanized by the explorations of Johns Coltrane and Tchcai, Evan Parker, Steve Lacy, Ornette Coleman and Albert Ayler, and also drew freely on groups such as Can, Faust, Weather Report, the Art Ensemble of Chicago and Soft Machine. Both of us were also heavily influenced by developments in contemporary ‘art’ music. From the beginning of our collaboration we determined to improvise all of our music. Within a year we found a kindred spirit in drummer Roger Telford, a committed exponent of the free-jazz style of kit playing being pioneered at the time by Milford Graves and Sunny Murray. 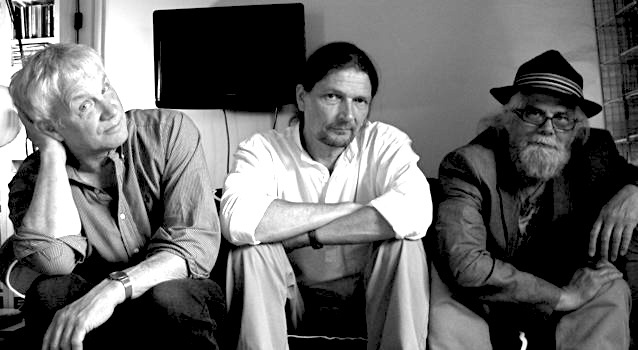 The line up of myself, Ian and Roger remained constant throughout the band’s original six year history, as did the commitment to total improvisation, but, given the group’s wide range of influences, our improvisations drew as much on avant-rock as they did on jazz or contemporary improvised music. Live, we could be punishingly loud (one urban myth recounts that a Red Square set drowned out Cliff Richard who was playing at a venue half a mile away!). We frequently enjoyed a combative relationship with audiences. Our enthusiasm for playing inappropriate venues (including folk clubs and pub-rock dives), and our willingness to engage forcefully with hecklers led to a number of hurried back-door exits from gigs, and presaged the arrival of punk a few years later. Thirty years later, in 2008, we were approached by FMR Records about releasing our old material. We so enjoyed trawling through the reels of tape to choose album tracks that we decided to re-form, and are now back gigging, thirty years after last playing together as Red Square, and recording new choice cuts of elemental, genre-defying, avant-rock and outer-limit free-jazz rampaging.